A beacon for any road-weary traveler passing through northern Colorado, Johnson's Corner began in 1952 as a humble gas station. That year, Joe Johnson opened the business on the wide open prairie. His pioneering spirit was rewarded a few years later when Interstate 25 was built through his own front yard. In six decades, Johnson's Corner has never closed its doors — staying open 24 hours, every day of every year. In that time, the truck stop has fed and fueled millions of travelers. Still, its (second-generation) owners take their greatest pride in serving loyal locals. "We're a neighborhood restaurant that dabbles in fuel," they say, having learned the ropes from Joe himself. 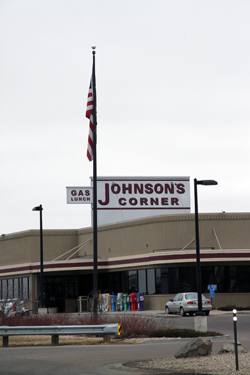 Stop at Johnson's Corner to refuel on gas, world-famous cinnamon rolls, coffee, and positive energy. And happy trails to you. These shirts are really soft and the print is great quality. Thanks!